Download "This chapter seeks to explain the factors that underlie currency movements. These factors include market fundamentals and market expectations." 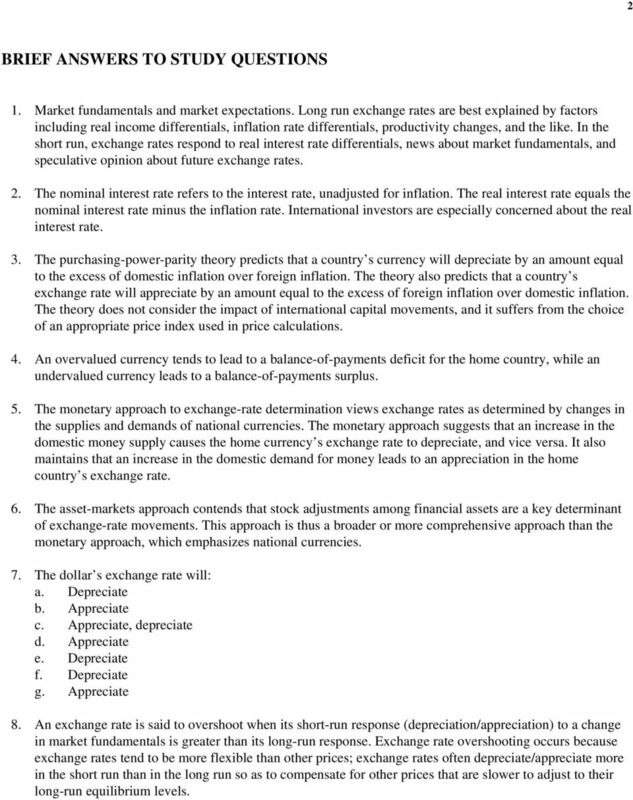 1 EXCHANGE-RATE DETERMINATION LECTURE NOTES & EXERCISES based on Carbaugh Chapter 13 CHAPTER OVERVIEW This chapter seeks to explain the factors that underlie currency movements. These factors include market fundamentals and market expectations. 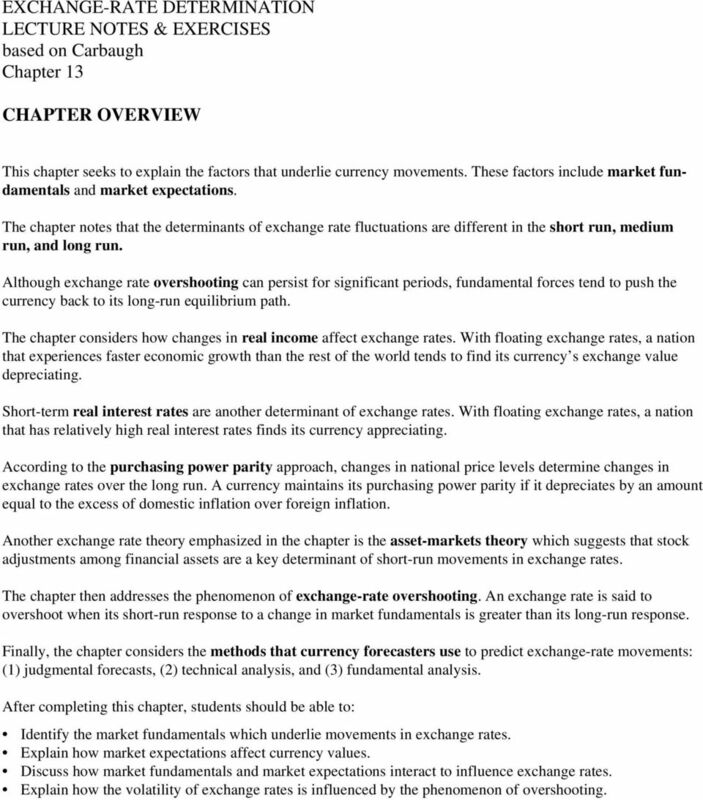 The chapter notes that the determinants of exchange rate fluctuations are different in the short run, medium run, and long run. Although exchange rate overshooting can persist for significant periods, fundamental forces tend to push the currency back to its long-run equilibrium path. 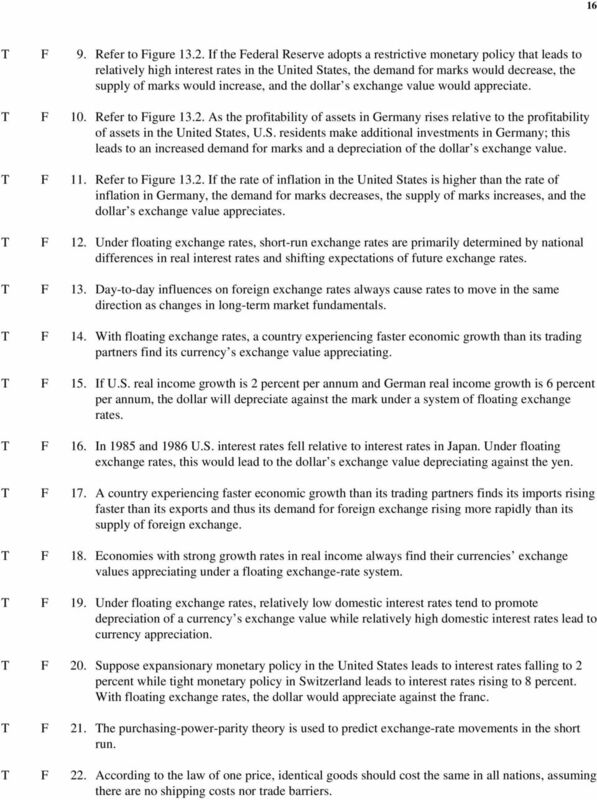 The chapter considers how changes in real income affect exchange rates. With floating exchange rates, a nation that experiences faster economic growth than the rest of the world tends to find its currency s exchange value depreciating. Short-term real interest rates are another determinant of exchange rates. With floating exchange rates, a nation that has relatively high real interest rates finds its currency appreciating. According to the purchasing power parity approach, changes in national price levels determine changes in exchange rates over the long run. A currency maintains its purchasing power parity if it depreciates by an amount equal to the excess of domestic inflation over foreign inflation. Another exchange rate theory emphasized in the chapter is the asset-markets theory which suggests that stock adjustments among financial assets are a key determinant of short-run movements in exchange rates. The chapter then addresses the phenomenon of exchange-rate overshooting. An exchange rate is said to overshoot when its short-run response to a change in market fundamentals is greater than its long-run response. 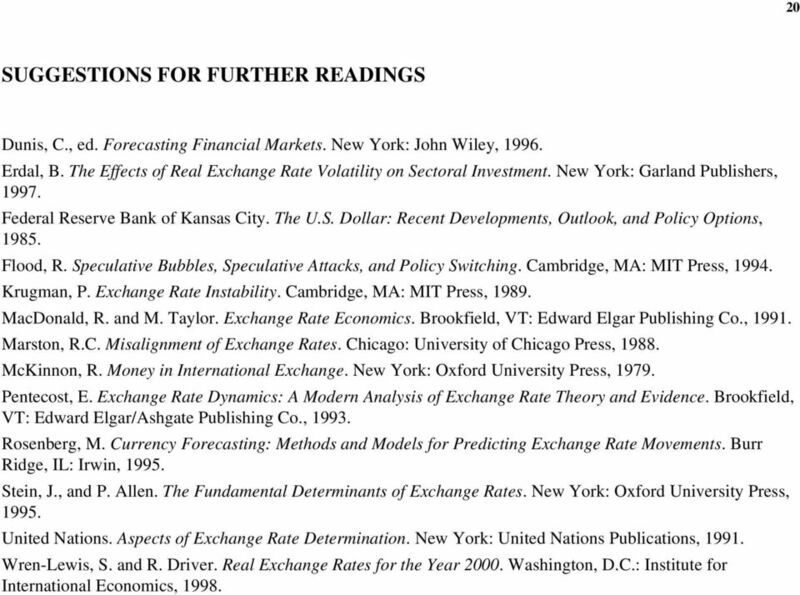 Finally, the chapter considers the methods that currency forecasters use to predict exchange-rate movements: (1) judgmental forecasts, (2) technical analysis, and (3) fundamental analysis. After completing this chapter, students should be able to: Identify the market fundamentals which underlie movements in exchange rates. Explain how market expectations affect currency values. Discuss how market fundamentals and market expectations interact to influence exchange rates. Explain how the volatility of exchange rates is influenced by the phenomenon of overshooting. 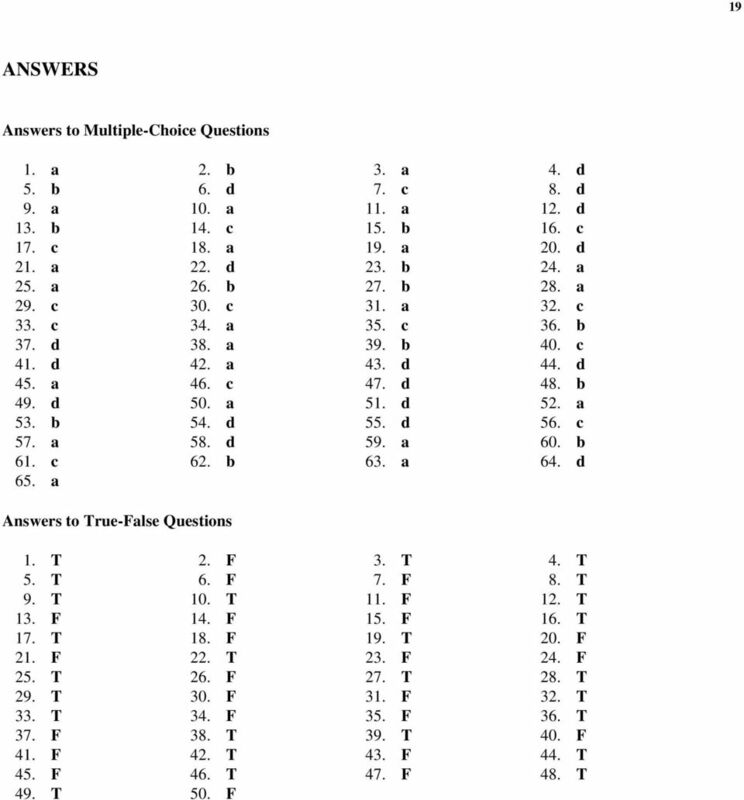 2 2 BRIEF ANSWERS TO STUDY QUESTIONS 1. Market fundamentals and market expectations. Long run exchange rates are best explained by factors including real income differentials, inflation rate differentials, productivity changes, and the like. In the short run, exchange rates respond to real interest rate differentials, news about market fundamentals, and speculative opinion about future exchange rates. 2. The nominal interest rate refers to the interest rate, unadjusted for inflation. The real interest rate equals the nominal interest rate minus the inflation rate. International investors are especially concerned about the real interest rate. 3. The purchasing-power-parity theory predicts that a country s currency will depreciate by an amount equal to the excess of domestic inflation over foreign inflation. The theory also predicts that a country s exchange rate will appreciate by an amount equal to the excess of foreign inflation over domestic inflation. The theory does not consider the impact of international capital movements, and it suffers from the choice of an appropriate price index used in price calculations. 4. An overvalued currency tends to lead to a balance-of-payments deficit for the home country, while an undervalued currency leads to a balance-of-payments surplus. 5. The monetary approach to exchange-rate determination views exchange rates as determined by changes in the supplies and demands of national currencies. The monetary approach suggests that an increase in the domestic money supply causes the home currency s exchange rate to depreciate, and vice versa. It also maintains that an increase in the domestic demand for money leads to an appreciation in the home country s exchange rate. 6. The asset-markets approach contends that stock adjustments among financial assets are a key determinant of exchange-rate movements. This approach is thus a broader or more comprehensive approach than the monetary approach, which emphasizes national currencies. 7. The dollar s exchange rate will: a. Depreciate b. Appreciate c. Appreciate, depreciate d. Appreciate e. Depreciate f. Depreciate g. Appreciate 8. An exchange rate is said to overshoot when its short-run response (depreciation/appreciation) to a change in market fundamentals is greater than its long-run response. Exchange rate overshooting occurs because exchange rates tend to be more flexible than other prices; exchange rates often depreciate/appreciate more in the short run than in the long run so as to compensate for other prices that are slower to adjust to their long-run equilibrium levels. 14 Suppose the exchange rate between the U.S. dollar and the Japanese yen is initially 90 yen per dollar. According to purchasing-power parity, if the price of traded goods rises by 5 percent in the United States and 15 percent in Japan, the exchange rate will become: a. 72 yen per dollar b. 81 yen per dollar c. 99 yen per dollar d. 108 yen per dollar 62. Suppose the exchange rate between the U.S. dollar and the Japanese yen is initially 90 yen per dollar. According to purchasing power parity, if the price of traded goods falls by 5 percent in the United States and rises by 5 percent in Japan, the exchange rate will become: a. 72 yen per dollar b. 81 yen per dollar c. 99 yen per dollar d. 108 yen per dollar 63. Suppose that the yen-dollar exchange rate changes from 85 yen per dollar to 80 yen per dollar. One can say that: a. The yen has appreciated against the dollar and the dollar has depreciated against the yen b. The yen has depreciated against the dollar and the dollar has appreciated against the yen c. The yen has appreciated against the dollar and the dollar has appreciated against the yen d. The yen has depreciated against the dollar and the dollar has depreciated against the yen 64. Given a floating exchange rate system an increase in would cause the dollar to appreciate against the mark. a. U.S. labor costs b. The U.S. money supply c. U.S. real income d. U.S. real interest rates 65. 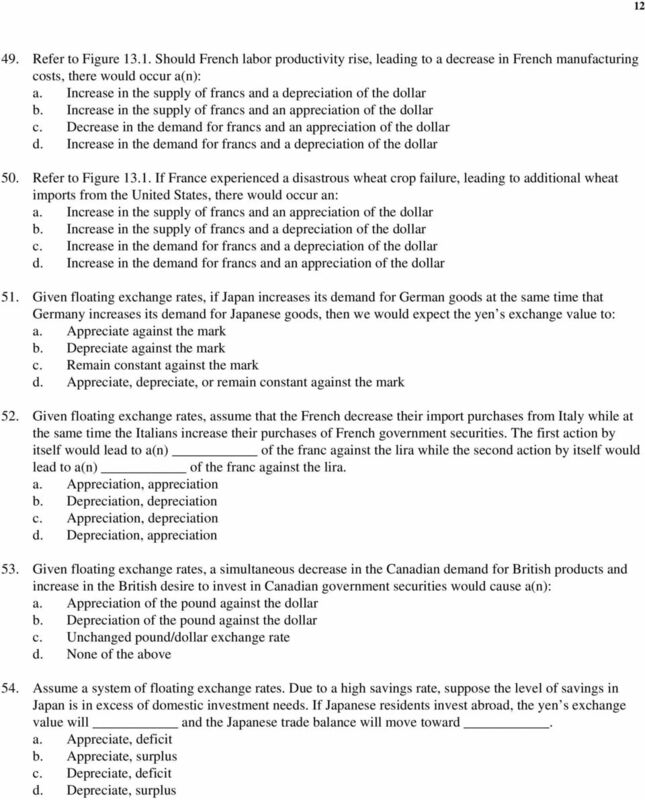 Under a system of floating exchange rates, a Japanese trade surplus against Canada would result in a(n): a. Rise in the dollar price of the yen b. Fall in the dollar price of the yen c. Rise in the yen price of the dollar d. Unchanged dollar/yen exchange rate TRUE-FALSE QUESTIONS T F 1. In a free market, exchange rates are determined by market fundamentals and market expectations. T F 2. Concerning exchange-rate determination, market fundamentals include real income, real interest rates, inflation rates, investment profitability, and speculative opinion about future exchange rates. 15 15 T F 3. Market expectations include news about market fundamentals, speculative opinion about future exchange rates, and profitability and riskiness of investments. T F 4. In a free market, the equilibrium exchange rate occurs at the point where the quantity demanded of a foreign currency equals the quantity of that currency supplied. T F 5. Exchange rates are determined by the unregulated forces of supply and demand for foreign currencies as long as central banks do not intervene in the foreign exchange markets. T F 6. Over the long run, foreign exchange rates are determined by transfers of bank deposits that respond to differences in real interest rates and to shifting expectations of future exchange rates. 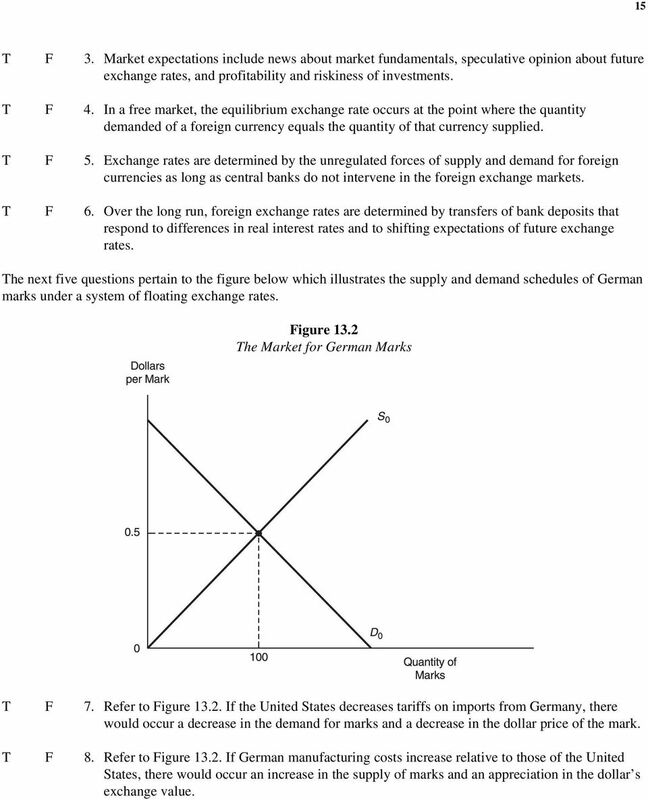 The next five questions pertain to the figure below which illustrates the supply and demand schedules of German marks under a system of floating exchange rates. Figure 13.2 The Market for German Marks T F 7. Refer to Figure If the United States decreases tariffs on imports from Germany, there would occur a decrease in the demand for marks and a decrease in the dollar price of the mark. T F 8. Refer to Figure If German manufacturing costs increase relative to those of the United States, there would occur an increase in the supply of marks and an appreciation in the dollar s exchange value. 16 16 T F 9. Refer to Figure If the Federal Reserve adopts a restrictive monetary policy that leads to relatively high interest rates in the United States, the demand for marks would decrease, the supply of marks would increase, and the dollar s exchange value would appreciate. T F 10. Refer to Figure As the profitability of assets in Germany rises relative to the profitability of assets in the United States, U.S. residents make additional investments in Germany; this leads to an increased demand for marks and a depreciation of the dollar s exchange value. T F 11. 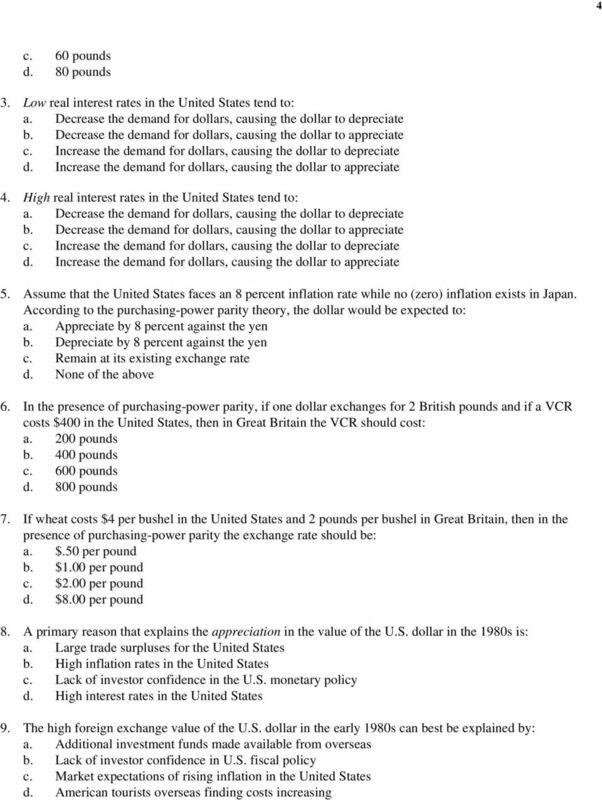 Refer to Figure If the rate of inflation in the United States is higher than the rate of inflation in Germany, the demand for marks decreases, the supply of marks increases, and the dollar s exchange value appreciates. T F 12. Under floating exchange rates, short-run exchange rates are primarily determined by national differences in real interest rates and shifting expectations of future exchange rates. T F 13. Day-to-day influences on foreign exchange rates always cause rates to move in the same direction as changes in long-term market fundamentals. T F 14. With floating exchange rates, a country experiencing faster economic growth than its trading partners find its currency s exchange value appreciating. T F 15. If U.S. real income growth is 2 percent per annum and German real income growth is 6 percent per annum, the dollar will depreciate against the mark under a system of floating exchange rates. T F 16. In 1985 and 1986 U.S. interest rates fell relative to interest rates in Japan. Under floating exchange rates, this would lead to the dollar s exchange value depreciating against the yen. T F 17. A country experiencing faster economic growth than its trading partners finds its imports rising faster than its exports and thus its demand for foreign exchange rising more rapidly than its supply of foreign exchange. T F 18. Economies with strong growth rates in real income always find their currencies exchange values appreciating under a floating exchange-rate system. T F 19. Under floating exchange rates, relatively low domestic interest rates tend to promote depreciation of a currency s exchange value while relatively high domestic interest rates lead to currency appreciation. T F 20. Suppose expansionary monetary policy in the United States leads to interest rates falling to 2 percent while tight monetary policy in Switzerland leads to interest rates rising to 8 percent. With floating exchange rates, the dollar would appreciate against the franc. T F 21. The purchasing-power-parity theory is used to predict exchange-rate movements in the short run. T F 22. According to the law of one price, identical goods should cost the same in all nations, assuming there are no shipping costs nor trade barriers. 17 17 T F 23. The purchasing-power-parity theory predicts that if the U.S. inflation rate exceeds the Japanese inflation rate by 4 percent, the dollar s exchange value will appreciate by 4 percent against the yen. T F 24. Assume the initial yen/dollar exchange rate to be 100 yen per dollar. If the U.S. inflation rate is 2 percent and the Japanese inflation rate is 7 percent, the exchange rate should move to 105 yen per dollar according to the purchasing-power-parity theory. T F 25. Assume the initial dollar/pound exchange rate to be $2 per pound. If the U.S. inflation rate is 8 percent and the U.K. inflation rate is 3 percent, the exchange rate should move to $2.10 per pound according to the purchasing-power-parity theory. T F 26. 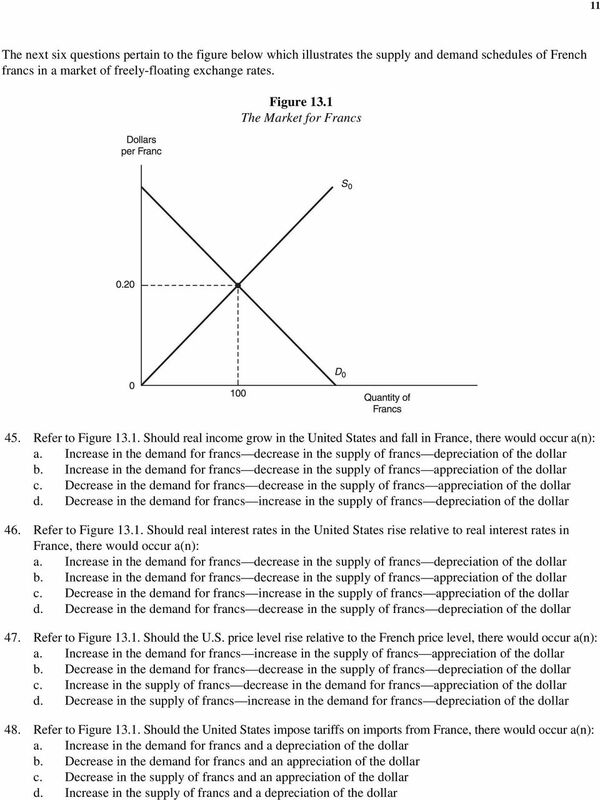 If consumer tastes in the United States change in favor of goods produced in France, the demand for francs will increase which causes an appreciation of the dollar against the franc under a floating exchange rate system. T F 27. As the profitability of Japanese assets rises relative to the profitability of French assets, French residents will make additional investments in Japan; this results in an increased demand for yen and a depreciation of the franc under a system of floating exchange rates. T F 28. If the United States experiences an enormous wheat crop failure, it will have to import more wheat and the dollar s exchange value will depreciate under a system of floating exchange rates. T F 29. If Japan realizes technological improvements in the production of automobiles, which lowers its production costs relative to foreign producers, Japanese exports will rise and the yen s exchange value will appreciate under a system of floating exchange rates. T F 30. If Mexico applies tariffs to imports of manufactured goods, Mexico s demand for foreign exchange will rise and the peso will depreciate under a system of floating exchange rates. T F 31. According to the Big Mac index, if a Big Mac costs $2.28 in the United States and krone in Denmark (equivalent to $4.25), the Danish krone is an undervalued currency. T F 32. According to the Big Mac index, if a Big Mac costs $2.28 in the United States and 48 baht in Thailand (equivalent to $1.91), the baht is an undervalued currency. T F 33. Starting from the point of equilibrium between the money supply and money demand, if the Federal Reserve increases the money supply the dollar s exchange value will depreciate according to the monetary approach to exchange-rate determination. T F 34. Starting from the point of equilibrium between the money supply and money demand, if there occurs an increase in the money demand the dollar s exchange value will depreciate according to the monetary approach to exchange-rate determination. T F 35. Changes in market expectations have their greatest impact on exchange-rate changes over the long run as opposed to the short run. 18 18 T F 36. If it is widely expected that the French economy will experience more rapid inflation than the German economy, the franc will depreciate against the mark under a system of floating exchange rates. T F 37. According to the asset-markets approach, stock adjustments among financial assets are a key determinant of long-run movements in exchange rates. T F 38. The asset-markets approach views exchange-rate determination as similar to the stock market in which prices are volatile and expectations are important. T F 39. According to the principle of exchange-rate overshooting, a short-run depreciation of a currency is likely to be greater than a long-run depreciation of that currency. T F 40. Exchange-rate overshooting is based on the notion that the supply schedule of a currency is more elastic in the short run than in the long run. T F 41. According to exchange-rate overshooting, an appreciation of the German mark is likely to be greater over a long time period than over a short time period. T F 42. Concerning exchange rate forecasting, fundamental analysis involves consideration of a variety of macroeconomic variables and policies that tend to affect currency values. T F 43. Econometric models are best suited for forecasting long-run exchange rates rather than shortrun exchange rates. T F 44. Concerning exchange rate forecasting, technical analysis extrapolates from past exchange-rate trends while ignoring economic and political determinants of exchange rates. T F 45. Given an efficient foreign exchange market, the spot rate is the rational approximation of the markets expectation of the forward rate that will exist at the end of the forward period. T F 46. A forward premium on the German mark serves as a rough benchmark of the expected rate of appreciation in the mark s spot rate. T F 47. A forward discount on Mexico s peso serves as a rough benchmark of the expected appreciation in the peso s spot rate. T F 48. If you were considering hiring a forecasting firm to predict future spot rates of the yen, you would hope that the firm could predict better what would be implied by the yen s forward rate. T F 49. Although the law of one price predicts that identical goods should cost the same in all nations, transportation costs and tariffs tend to prevent this prediction from actually occurring. T F 50. If real interest rates decline in the United States relative to real interest rates abroad, the dollar s exchange value will appreciate under a floating exchange-rate system. 20 20 SUGGESTIONS FOR FURTHER READINGS Dunis, C., ed. Forecasting Financial Markets. New York: John Wiley, Erdal, B. The Effects of Real Exchange Rate Volatility on Sectoral Investment. New York: Garland Publishers, Federal Reserve Bank of Kansas City. The U.S. Dollar: Recent Developments, Outlook, and Policy Options, Flood, R. Speculative Bubbles, Speculative Attacks, and Policy Switching. Cambridge, MA: MIT Press, Krugman, P. Exchange Rate Instability. Cambridge, MA: MIT Press, MacDonald, R. and M. Taylor. Exchange Rate Economics. Brookfield, VT: Edward Elgar Publishing Co., Marston, R.C. Misalignment of Exchange Rates. Chicago: University of Chicago Press, McKinnon, R. Money in International Exchange. New York: Oxford University Press, Pentecost, E. Exchange Rate Dynamics: A Modern Analysis of Exchange Rate Theory and Evidence. Brookfield, VT: Edward Elgar/Ashgate Publishing Co., Rosenberg, M. Currency Forecasting: Methods and Models for Predicting Exchange Rate Movements. Burr Ridge, IL: Irwin, Stein, J., and P. Allen. 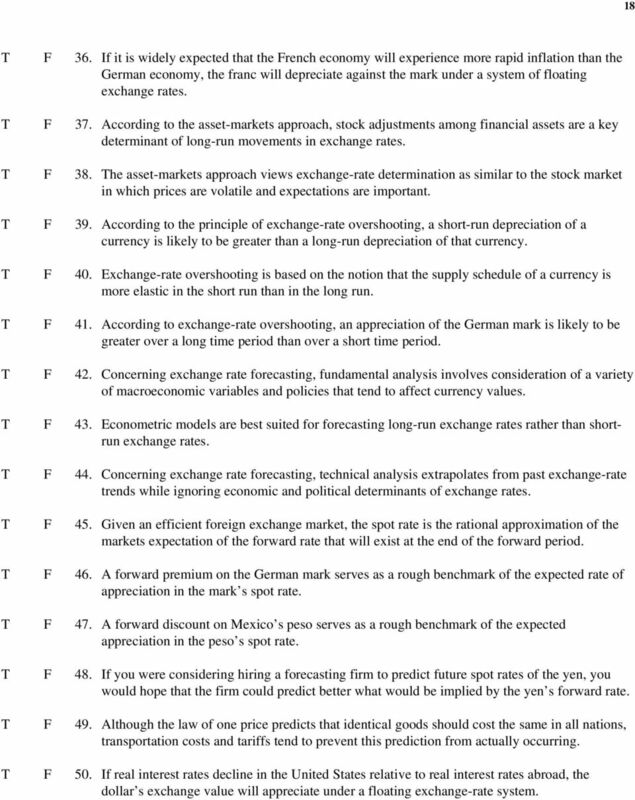 The Fundamental Determinants of Exchange Rates. New York: Oxford University Press, United Nations. 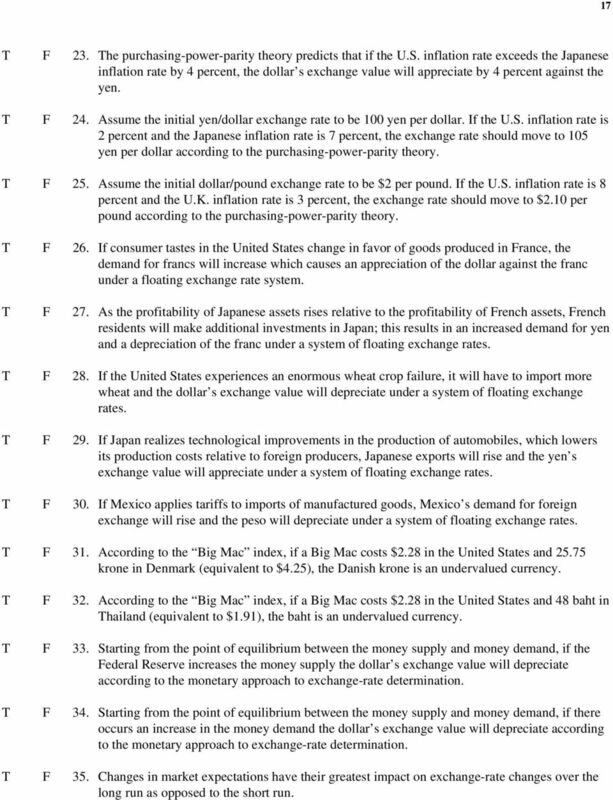 Aspects of Exchange Rate Determination. New York: United Nations Publications, Wren-Lewis, S. and R. Driver. Real Exchange Rates for the Year Washington, D.C.: Institute for International Economics, 1998.